End It All is the fourth solo album (and the first on Anticon) from Beans, the former Warp Records artist and member of Anti-Pop Consortium. Features Four Tet, Clark, In Flagranti, Tobacco, members of Interpol, TV on the Radio, Tortoise and more. 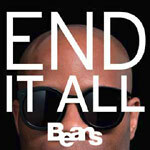 ''End It All'' is the first Beans album to feature all guest production, and it finds the emcee pushing his distinct staccato rhyme style to new heights across a varied but fluid buildup of beats.